The Government set out its definition of British values in the 2011 Prevent strategy, and these values have been reiterated in 2014. At Saint Aidan's Catholic Primary School these values are reinforced regularly and in the following ways. Each year the children review the school Code of Conduct to ensure that they are still relevant. The School Council meets regularly and discusses issues raised in class or as a whole school. Each council member is voted for by their own class. Children will soon have a questionnaire where they will be able to put forward their views about the school. The importance of laws, whether they be those that govern the class, the school or the country are consistently reinforced at Saint Aidan's Catholic Primary School. Pupils are taught from an early age the value of the Code of Conduct. Children are taught the value and the reason behind the rules and the laws, that they govern and protect us, the responsibility this involves and the consequences when laws are broken. Visits from authorities such as local Police and the Fire Service help to reinforce this message. At Saint Aidan's Catholic Primary School, children are actively encourage to make the right choices, knowing they are in a safe and supportive environment. Children are expected to take responsibility for their own actions and to understand the consequence their actions might have. We educate and provide boundaries for children to enable them to make informed choices, through a safe and supportive environment. The understanding of rights and responsibilities are promoted through acts of collective worship, e safety, PSHCE. Mutual respect is a core value at Saint Aidan's Catholic Primary School. Children learn that their behaviours have an effect on their own rights and those of others. All members of the school community treat each other with respect. Saint Aidan's Catholic Primary School is situated in a culturally diverse borough. The school recognises its role in preparing children for life in modern Britain. We actively promote celebrations of different faiths and cultures. Through RE and Personal and Social Education we reinforce messages of tolerance and respect. 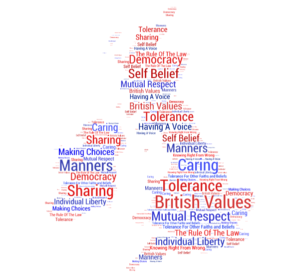 At Saint Aidan's Catholic Primary School we will actively challenge children, staff or parents who express opinions that are contrary to fundamental British values including extremists views.